When I first started collecting Hamiltons I turned up my nose at the Swiss-made models before I really understood what was going on in Hamilton's history. Most collectors focus on pre-1969 when Hamilton manufacturing was still going on in Lancaster PA. So it seemed logical to me that the US-made models would be the ones collectors should focus on. Of course, if that was true then you'd never collect any Hamilton Automatics and even some of the cool asymmetric watches like the Thor II would be off limits. I eventually realized that Hamilton introduced Swiss movements to compete at lower prices points with other American and European watch brands. Swiss movements enabled Hamilton to have a robust line up with something for everyone's price range. That said, the US-made watches tended to be used in higher end models and usually came in solid gold or at least gold filled cases. 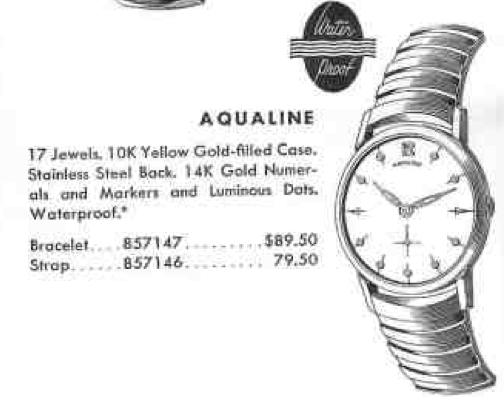 Take for example the 1957 Aqualine - it was produced for four years. The Aqualine comes in a 10K gold filled case with a snap-on stainless steel back. The sterling silver dial has 14K gold markers and numerals with matching luminous hands. Tucked inside is a 17 jewel shock-protected 730 movement - made in Lancaster PA. These pop-off backs have a gasket in between the bezel and the back. They can be a bear to open. In addition, if the gasket is in bad shape they won't close up tightly either. I much prefer a screw-on back, to be honest. With considerable effort and a little WD-40 I was able to break this one loose. The 730 is a shock-jeweled upgrade to the 8/0 sized 747 introduced in 1947. This one is a little dirty and apparently lost the enamel in the lettering during a prior cleaning - just HAM is left with enamel. This watch has a very strange movement ring. It's sort of spring loaded and was pushing on the dial - that's what made the second hand rub the dial and stop the watch. This ring also made it hard to remove the stem… I wonder if it's original to the watch? The dial appears to be original and is in good shape - just some minor spotting here and there and a very faint radium burn from the lume in the hands. I'll remove the lume and redo the hands and dial with modern luminous material. The reassembled movement is purring like a kitten and ready to go onto the timer. After doing this for a few years I think I've gotten to the point where I can gauge whether or the movement is running well just by looking at the balance. I can definitely tell if it has an issue - that's for sure. This one looks great. Of course, the best way to tell how a watch is doing is to use a timer and based on the shot below, this watch is doing just fine. With the movement doing it's thing, I'll get to work reluming the hands and hour markers on the dial. These little kits can be rather expensive but they will do a lot of watches if you don't waste it. There's a clear lacquer (like nail polish), luminous powder, thinner, a bowl and an applicator. Applying lume is fairly easy - you just mix it to the consistency of paint and then sweep it on the hand from behind and let it dry. It reminds me of putting soap on a ring when blowing bubbles - the lume spreads like a thin film and fills the open space in the hands. I stick them into a piece of pith wood until they dry. The hour markers are little gold cups and each cup gets a dollop of lume. Finally, here's the finished project, all polished up and with the new lume it looks much cleaner. This style of hands is called an "open leaf" and when set at 10:12 (the usual display time Hamilton used) they always remind me of the Cheshire Cat. When they're glowing they are even more cat-like… no?